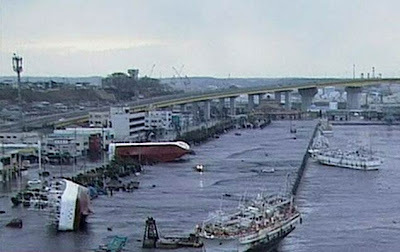 A screen grab taken from news footage by Japanese public broadcaster NHK on March 11, 2011 shows capsized ships at a port of Hachinohe City, Aomori Prefecture. Initial reports indicate that all cruise ships in Japanese waters at the time of the 8.9 quake and subsequent tsunami are safe and undamaged. Vessels included Azamara Quest, QM2 and other ships. Experts attest that ships at sea in deep water will be unaffected by a passing tsunami. Only those in port or shallow waters are at risk. Oceania Cruises' Nautica is also currently planning to make its upcoming port calls as planned in Kobe and Okinawa, both hundreds of miles from the quake zone. A report that mentioned a 100-passenger ship being swept out to sea and missing has been clarified. The ship, owned by a Ishinomaki-based ship builder, was found and all 81 persons declared safe. It was not a "cruise ship" as mentioned in some reports.